Neuroticism – A Competitive Advantage (Also) for IVAs? 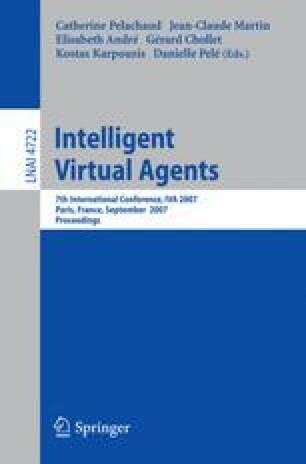 Real-Time Strategy (RTS) games are a challenging genre for the design of Intelligent Virtual Agents. We were interested whether incorporating a simple emotional model to an existing bot-script improves playing strength. We implemented a bot for Microsoft’s RTS game “Age of Mythology”. The emotional model is based on the “Big-Five” and the Emotion-Connectionist Model. Four variants of the bot were evaluated, each using different personality parameters; one of the variants was designed to show “neurotic” behaviour. The emotion-driven bots were evaluated in a bot-versus-bot setup, playing matches against the game’s default script. Evaluation results indicate a significant increase in playing strength, the “neurotic” bot being the strongest one.